Wow! It’s a great honor to be chosen as one of the speakers at the 2011 Texas Invasive Plant and Pest Conference at the Lady Bird Johnson Wildflower Center in Austin, Texas, from November 8-10, 2011. This conference is a great opportunity to learn about invasive plants, insects, and other pests across Texas. My talk is entitled, Origin of an invasive hunter: Educating kids of all ages about invasives. Join Commander Ben as he talks about how he learned about invasive plants and became an intrepid invasive hunter. 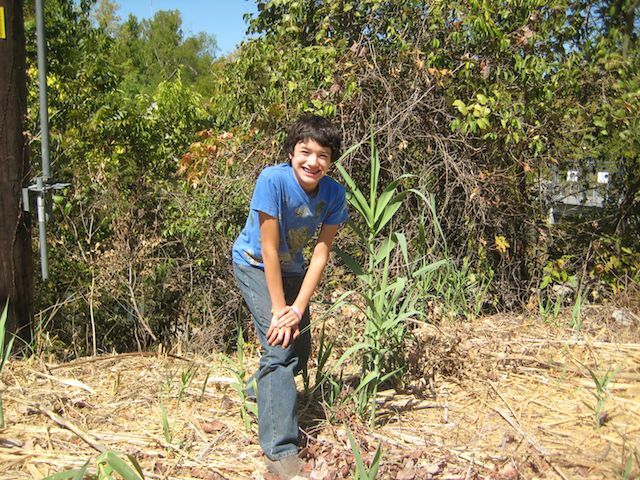 You’ll discover his journey learning about invasives from key Internet and professional resources to his science and field experiences. He will describe the creative and technical process that he used to create humorous YouTube videos to help educate kids and adults about the impacts of invasive species. Commander Ben’s videos were featured in the July 2011 issue of iWire, the monthly newsletter about invasive plants and pests in Texas, and his first video about Arundo donax, “Who will fell this Titan?“, won first place at the University of Texas science under the stars video contest in spring 2011. I hope that you’ll join me at the conference. I look forward to meeting you and the other scientists attending the conference. Tell me about the invasive plant (or creature) that you find the most interesting. I’m always looking for new co-stars for new videos!